Celebrities hunt for antiques across the UK. Strictly Come Dancing's Zoe Ball and Ian Waite are quickstepping their way to an auction in Hampshire. Browse content similar to Zoe Ball and Ian Waite. Check below for episodes and series from the same categories and more! I'm trying to spend money, here. with a graceful pair of Strictly pals. in a lovely old vintage car, don't you think? I know. With a beautiful woman at your side. Sadly, she couldn't make it today, so you're stuck with me! Sorry. Yes, it's top dancer Ian Waite and broadcaster Zoe Ball. Right now, it's time for Blobby. on shows like SMart and Live & Kicking. Line one this morning, who's on line one? before going on to become one of television's most trusted presenters. ..and made a lifelong friend in dance partner Ian Waite. Do you think you and I will still be friends at the end of today? Um, I doubt it. Unless you let me win! Professional competitor Ian started dancing aged ten. before joining the Strictly Come Dancing team. to a spin-off show, It Takes Two. -It's a bit like this. -Oh, my Lord! Look at him go! Ha! But today's talk is strictly about antiques. What do you know about antiques, Ian Waite? Well, I know absolutely nothing. seem keen for a bit of a turn. -Doing what, the Gay Gordons? I know where you're going with this! How very dare you?! Fancy being thrown round a few antique shops by Ian? I'd smash a few pots! -given that we've got the same dad. Well, there may be some family rivalry there, Paul. but whatever happens today, I have to beat my dad. he managed to lose £105. And he's the one who's good with maths! Johnny Ball on his Road Trip. I've never enjoyed wasting money so much. So, if I can beat my dad today, that would be a turnout. Ha! There's a lot riding on this one, then. and a 1965 E-Type Jag. Can I just say, Ian Waite, this is one of my dreams come true. It's one of my worst nightmares! E-Type Jag, how can that be a nightmare for you, though? -Well, my legs are up near my ears, darling. Time to get things moving, then. I want the car. I don't care about this, I want the car! I'm never going in a car with him again! -Why, has he frightened you? -No, I'm joking. He was amazing! I don't know how to get out! We can't get him out cos his knees are round his neck. -It wasn't so bad getting in! -Promise you'll teach me how to dance. You're a good height for me to dance with. -I'm going to get jealous now. Come on, we can do that, we can do that. Come on. So, which car are we having? -You've got to drive it. -How do you decide who drives? -It's got to be you. -Do you trust me with your life? -I'm getting in. Good luck, darlings. let's set off into the countryside. Our hopefuls start their journey in Dulverton in Somerset. en route to an auction at Selborne in Hampshire. Now, time to get acquainted. and then this huge lump on the end. It didn't suit me, so I gave that up pretty quickly. Have you thought about doing Strictly yourself, Paul? So, what are your tastes, then? Well, do you know what? I love Art Deco, and paintings as well. I mean, I sort of, you know, grew up painting a lot. -Yeah, so I'll definitely be looking at the paintings. Well, let's see what we can do, then, Ian. and the first shopping stop of this trip. and the offerings look a little on the classy side to me. -The old pawnbroker's sign, isn't it? -That's what would be hanging outside pawnbrokers' shops. 3,200. Yeah. I think we're a bit short for that. These dummy boards - really lovely, those, aren't they? -850. They're expensive, aren't they? OK, it's out of our budget for now. Well, all we need is a bit more money in here. -And then we'd be fine, wouldn't we? Never mind, Margie. I'm sure you'll find something. You know those little lazy Susans that whizz round? Ian does not look convinced. -You can use it a lot - what's that word? Blimey! Well, at least it's in your price range. -Simon, nice to meet you. Barney, I was just wondering if you could give me a few tips. if you could give two yaps, that would help. He doesn't look keen. You'll have to settle for a yap from Paul. -Shall we divide and conquer, Zoe? -OK. Yes. OK, we're stronger. You do what you're doing. I'm going to recce over here. Come back to me. Good luck. Oh, do you know what? Backgammon - my favourite game. It's probably a gravy boat! You're looking at me like I'm an absolute lunatic. Oh, do you know what? I love an old tap. See, normally when I go shopping, I'm very quick. I know what I want, go into a shop. I'm sort of known for my speed. cos I'm having to take my time and really have a good old think. and see how your competitors are getting on back in Dulverton. -Yeah. It's quite nice, isn't it? -Yeah. If it had an attribution, it would be fine. It's like a painting, isn't it, on the wall? -You're a bit of an artist, aren't you? -I AM a bit of an artist. -I like modern art, or abstract art. -when you can see the texture of the paint. Yeah, it is nice. It is nice. -But will it sell? That's the thing. -Yeah, this is it. Ohh! time to speak with Peter, perhaps. What sort of price would the palette be? -Could you do it for 60? I'll come down to 60. -Well, it's up to you now. -I'm happy to go for that as our first item. I think it's a nice item, and it's an unusual item. First item of the Road Trip bought. -I'd quite like it for my house, actually. Now, what have Zoe and Paul got their eye on? -And what does it say to you? -That says to me, "Huh?" -You know what I think it is? I think it's a lightning conductor. Wow. I don't think I've ever seen anything like it in my life. -It's the second I've seen. -channels it down a big copper rod, to earth. The cage is counterintuitive to me. I don't understand the cage. ..which, if anything, would protect the spike from the electricity. But, hey, look, we're getting way too serious. -There's someone out there for that. -There is someone out there for that. so I feel that that, like you say, it's a great talking point. Something to think about. Anything else? ..is someone else's manky old hairbrush, OK? -..hairbrushes - never seen a head, these. That's not nickel or chrome. That's sterling silver. -£28. Can you believe that? very much good to go. Simon's got dealer Alan on the phone. -Hang on, I'll put her on. Tell me about gentleman's hairbrushes. Yeah, that sounds better than £28-ish. I thought you were going to say, "As it's you, I'll do it for 15." But, no, we're sticking with 20! Alan, you're amazing. Thank you so much. I'll hand you back to the boss. Thank you, darling. -"I'm no good at negotiating"! What?! Well done, Zoe. A £10 discount on the brushes. The problem is, Alan has set a very high benchmark in niceness. Back to the lightning conductor! Oh, yeah, right, Paul. It had an original price of £55. -Come on, then, show me how this is done. This is like Federer and Murray. That is... That is a giveaway price for such an unusual item. Just clipped the net, just clipped the net. It's in, it's in. It's good. -Let's have another look at that. -Oh, you've moved, you've moved. -That was more than you were going to pay, Paul. Not sure you meant that, but that's the deal done. -That's not bad - two things, one shop. Two things. I'm really excited about both of them. Oh, hang on a minute. I thought we were done in here. or he's about to do some magic. A pair of 19... I would say '60s cufflinks. Do you recognise the device, the badge? North Atlantic Treaty Organisation - Nato. Ooh, Nato. Tell me more, then. -I'm just going to tell you they're a fiver. -Are you going to surprise me? I am putting my trust in you. Come on, Paul. What do you know? -That there says "Ole Bent Petersen". and, if you didn't know, this kind of thing floats Paul's boat. -Look how excited you are. There's virtually steam coming off the top of your head. and one very happy expert. That was magic. What a start! I know, what a great start. It was only the first shop. When you were a little boy did you say, "I want to learn to dance,"
or did your parents say...? and my parents got divorced. "Oh, well, why don't you go, Ian, and your brother?" -Actually, my dad married my dance teacher, yeah. -So the whole thing worked really well. It was cheap lessons after that! Margie and Ian have travelled 14 miles down the road to Tiverton. combined to play a crucial role in developing Britain as an industrial powerhouse. We're here, darling. We are. Barge owner Phil Brind is here to tell them all about it. -It is. Isn't it great? Indeed, this is the last horse-drawn barge in the south-west of England. -They're very, very rare now. And there is your horse. -His name is Ross. Would you like to meet him? first flourishes of the Industrial Revolution. endeavour, as cottage industry moved towards large-scale manufacture. a familiar source of power needed to be harnessed in a new way. of weight along and you only needed one horse to do it. it's actually not as difficult. is equal to pulling 40 tonnes on water. but few waterways went where the commerce needed them to go. over land to industrial Manchester, a slow and inefficient process. That was until 1761, when England's first canal opened. 4,500 miles of inland waterways being constructed. horse-pulled barges became a familiar sight across the country. and is pulling the barge along. So, the horse has got to be used to this angle. The term "towpath", does it actually come from towing a barge? -have on all our canals in Great Britain. -So it does come from that? with larger breeds being left to work on farms. -I think it's absolutely unbelievable. -It's so peaceful, as well. We're controlling now. We're in charge. You're controlling it, yes, you're controlling it. allowing quick and economic transport of goods. But as new technology developed, their days were numbered. Phil, what brought on the demise of the horse-drawn barge in the end? Well, first of all it was steam. That really was the start of the end of the canals. canals really took a dive. by diesel boats as well. one diesel boat took twice the amount of payload. was the same force that made horse-drawn barges outdated. crucial role in Britain's industrial history. It's been an absolute privilege, hasn't it, Ian? -To step back in time and be on one of the last horse-drawn barges. -Thank you very much for coming today. to Carhampton to squeeze in some shopping at Chris's Crackers. -So we've a wee bit of interest in this one. I know. I'm quite excited by this. -Hi, nice to meet you. Zoe. who also happens to be in charge. Time for the guided tour. -This is our main junkyard. mostly furniture inside, there's more out the back. -Everywhere you want to look. This place specialises in reclamation and salvage. And there's plenty of it. Time for a good rummage, eh? What do you think's going to be in there? There's going to be nothing but silver-plated cutlery, if anything. -There you go, fish knives. Is that fish knives and forks? Work ethic, that's the problem, worth ethic. Oh, hello. I do love me a casserole, I have to say. -Anyway, where did they go? Sorry! Oh, hello, Peter has something he wants to show. Lignum woods, by FH Ayres. One of the bigger names in garden toys. They're great. When would they date back to, then, a set like that? They're going to be early 20th century, aren't they? -They're decoration for your gardens, your sunroom. I mean, come on, evocative. and play skittles, you know? Very good. No, you're right, very good. Yeah, yeah. What's your price on those, then? 25 quid, something like that. -I wouldn't even haggle at that price. -The box is worth that. Do you know what? If it doesn't sell at auction, maybe I'll buy it. But it's still a good deal. plenty of time for our experts and celebs to be reunited. I've never won anything, so I've not got high expectations. Have you ever won Strictly Come Dancing? -All right, don't rub it in! Another day dawns in the glorious south-west scenery. I'd rather be able to see the field, personally, wouldn't you? Should we write a letter? because the stuff I would buy is basically bric-a-brac which is worthless. things I'd bought in the past were complete junk. Now you know what we feel like when you buy us presents! I'm sure it's not as bad as all that. -..leaving them with £326 in their pocket. Morning, campers. It's never easy getting out of these things. -How are you doing? Good to see you. -Are we going to do this again? He has promised he's going to teach you some moves today. We'll have a little competition at the end of the day. I'm going to let you drive, is that all right? Paul, do you want to drive today? Off we go, then. Good luck. Have a lovely day. But how is everyone feeling about the day ahead? -Are we chilled this morning? "have quite a nice day today." I have to say all thanks to you, Paul, and your incredible eagle eyes. Did Paul tell you what they found yesterday? me up. Did Zoe say anything to you? No, she just said that she was rubbish. -..so she will want to win. She'll be gracious when she gets beaten. -Blimey, things have got competitive all of a sudden. where they'll kick-start another day shopping. -Right, so a lovely day in Lyme Regis. It always is, even when it's raining. shelves of the Lyme Regis Antiques Centre? Look at that old chicken up there. Look. He's actually so awful, it might be worth something. We're in Paul Laidlaw land now. Quite a few people have had their lips around that. I wouldn't, if I was you. a bit of age to them. That's quite nice. Very similar to your ring. It is. -Gosh, that's a small finger. Don't give away all your secrets, Ian. -Gosh, that's for a small finger, isn't it? -They're better a bit bigger. You can always have them altered, can't you? You've got to have a bit of thickness in them. The ticket price is £140. Well, we can have a word with him. -I like this vase up here. -It looks sort of retro. -Is that the sort of thing you would buy? I reckon it's worth about 45-50. Is that all we'd get in auction? It's time to turn on the charm, Ian. -He looks like Frankie Howerd, doesn't he? Colin gets the vendor on the phone to get a best price. -Sorry. I can't do any more. I spotted that colourful little tea set down there. Oh, yes. It's very nice. Derby-esque, isn't it? -That's very sweet, isn't it? -How about 55 for the lot? -I haven't said I want it yet. How about not 55 for the lot? We've got to make a profit on this, Colin. I'll tell you what, I'll go in the middle for you. 45. One, two, three, four, five, six. Six cups. Maybe more than that. Eight cups. Yes, there's eight cups there. I think we've got to go for that, Colin. -Like it? Has he even seen it? Well, it's not my taste, but you like it, so let's go for it. -Oh, gosh, he's not keen. -No, no, it's all right. It's good. If you think we can make a profit from it, let's do it. -We've only got one item so far. -Right, 40 because I'm nice. Yes! I love you, Colin. Margie wants to know what that £140 ring could be. You know the worry about that, Col. There's always some worry. It's very small. It's for a very small finger. I sell lots of them. So not everybody has big fingers and not everybody has small. That's got to be really, really cheap, because I'm worried about it. Why don't we say 50? I like it because it's my birth stone, isn't it? Do we get a little chip for two? No, 100. 100. That's it. -Only if you'll dance with me. No, my feet are hurting. -Yes, we'll do that deal and we'll do that dance. That's two items for £95. Elsewhere, Zoe and Paul are enjoying their jaunt in the countryside. Have we just entered Middle Earth? That's an incredible gorge that we've just gone through. -I'd love to tell you what county I was in. heading for the village of Honiton. most important lace producers in the world. They're at the town's museum to meet lacemaker Pat Perryman. -Yeah, fabrics. This piece, here, what can you tell us about this piece? This piece is very early, about 1630, 1640.
lady. So maybe Paul might have worn something like this in those days. Can you imagine yourself in lace, Paul? In the 16th century, a new type of material was taking Europe by storm. to make intricate, open fabric patterns. It wasn't until the late 19th century that ladies wore lace. This is a rather large actual triangular shawl. Maybe you'd like to wear it. -Maybe Paul would like to help. -Where Zoe's hand is should go at the back of her neck. Lacemaking was a painstaking process. One square centimetre could take five hours to weave. ensuring it was the perfect status symbol. It's only the upper echelons of society that can wear it. in those days. The posher you were, the more expensive your lace was. Honiton lace was particularly intricate and was unique in manufacture. concentrating on a single motif. Honiton's elaborate patterns became unrivalled across Europe. Honiton lace is motive lace. In other words, we make it all in separate motives and join together. So these are patchworks, in a sense? Yeah. The more experienced ladies made the edge pieces. The boss would have said, "I want 40 of those." They would repeat, repeat, repeat. the small bits that filled in. How old would the children have been? They started at five years old for 12 hours a day. I know! I must have a word with my children, actually. a quarter of east Devon's population was employed in lacemaking. was passed requiring them to attend school, the town defied the Government. Local boys and girls continued to work. The lace industry around Honiton was the heart of the community for generations. from Nottingham, it struck a heavy blow. Does mechanisation harm this industry in any way? Absolutely, it did and a great deal. the handmade-lace industry almost died. and that brought back the industry. wedding dresses were often brightly coloured. wedding tradition in this country and saved the handmade-lace industry. monarch in Britain for 300 years and attracted huge attention. became an iconic fashion statement. Victoria had reinstated handmade lace as a must-have garment. Her support of the British industry continued throughout her life. She wore black for the rest of her life. If she wore black, all the smart ladies wanted black, of course. like Pat, and soon Zoe Ball. -do lacemaking. So, Pat, where do we start? -When they're passing over each other. which is then twisted and crossed over each other to form a pattern. Now you're going to twist each pair three times. Right bobbin over left? So one, two, three. And also the other pair. I hope you're taking note here, Paul. Three. You're next. How am I doing, Pat? -For a beginner, I'm all right. -We haven't looked too closely at the lace yet. worldwide popularity and the support of the royal family. How long will I be here, do you think, to finish this piece? For about ten hours a day for about four days. That's fine. My husband can feed the children. Let's leave them to it, then. the Old Chapel Antiques Centre. Richard is overseeing three floors crammed with antiques. Plenty to keep everyone happy, which is just as well, really. -I know. No time to waste. Thankfully, neither of them would know a bargain if they saw one. Ian and Margie are taking this very seriously. Rock, back, side to side. Rock, forward, side, close, side. Rock, rock, side, close, side. I wonder if we can get Ken Bruce on this. -Anyone planning to do any shopping today? Back, forward, cha-cha-cha. Forward, back, cha-cha-cha. -So, do I have to put it back down again? Am I picking it up? There's some people over there. I think we're going to put it back, aren't we? -What can you tell me about this? Lava glaze refers to this very fluid-looking, intense acid colour. Ticket price is £68 for the bowl and £48 for the dish. it going in the charity shop at New Year? Do you know what? No, I probably would use that. it's quite a narrow market. Niche. OK, I'll walk on. -Quite the pair now, aren't they? How are things going upstairs? Railway armour, they call it. Would they be on the actual trains? Yeah. No, that would be on the track here. These, I'm not sure what these are. Not being an ex-railway worker. -Right, what does it say there? -Whoa. Wow. I haven't been to the gym today. -I've worked my triceps out. -Oh, hello! How are you? -Very well, how are you? Very, very well, isn't it? Is she bluffing? You know her better than I do. Well, they're about 30-odd pounds each, aren't they? I like this one because it's nice and big. And with the three collated numbers. One, two, two. One, two, three and one, two, four. -Shall we try and get them for 80 quid? -I think you'll be fine. -Shall we start at 60? -Do we take them with us? Start at 65. That just sounds a bit easier. Then he might say 70. Those four signs have a combined ticket price of £134. -We've got these wonderful bridge plates. -We're thinking of a one-off price. -A one-off for the lot. I'm thinking sort of £65. Ian has asked for around a 50% discount. So Richard is off to speak to the dealer. You did well. Let's see if you've pulled it off. -Thank you very much and thanks to the dealer. I was going to high-five you. Yes, I struggle with that sometimes. I'm scared I'm going to miss them. I'm with you, Richard. Either way, that's a cracking £69 discount. I hope I remember all these things that I'm learning from Paul. Yes, he's quite the chap. Now, anyone found anything else? Margie, come and have a look at these. -Don't you think the poppies are lovely on there? They are. Nice and bright. They are. -What would you put in there? -A fruit bowl. I would have that. -Would you bid for that? -Yes, I would bid for that. Do you want to speak to the man, then? Well, yeah. I mean, yeah. I think so. I think both would be nice and sell them as a job lot. The ticket price is still £116. What's the best price Richard could do on behalf of the dealer? For those two pieces the very best would be £80. Yeah, I quite like those for £80. -They might not make anything but they look nice. £145 gets you the two 1960s dishes and the railway signs. Like that, your shopping is done. Which leaves Zoe and Paul the run of the shop. If it's what I think it is... And it is! Miss former presenter on Radio 1 and still a big thing. So is this an early radio system? This is a crystal receiver. makes contact with our galena crystal. Don't ask me to explain the science behind it. It dates to... This is the early years of radio broadcasting. So Pa is in the front parlour. With this on your ear, they're quite heavy. This is the World Service calling with a very strange accent. Nobody ever spoke like that, did they? They did. Their lips didn't move. Do hurry, Harry. I'm not receiving you. -That's where it all began. -The price tag says £60. I think, to a collector, that's a good buy. and that's before auctioneer's costs. So, some work to do on the price. We haven't seen Richard for a while. So he's got £60 on it at the moment. -Again, I can speak for him and I know he'd do it for 45.
that's where you can go at the moment without making a call? I know that's where I can go at the moment. What sort of price were you thinking? I'd be happier at 35 than 45. That's OK. I'll take the risk. He must be a dear friend. Well, also, I want you to win, anyway, don't I? Richard, I knew I liked you. The 1920s radio hails the end of shopping for this Road Trip. Time to own up to what you bought. This looks very Laidlaw, this. Has he been influencing you? It doesn't look like you picked any of these, Zoe. -What do you want to know about first? Bowls! That's nice, isn't it? They do, they make great doorstops. -How much do you think we paid? Here we go, he's building everything up. -Ole Bent Petersen, major artisan. Those are nice. Very nice. Very special. better to... With the Balls, you know, maybe we should spend a little less. You're not really playing the game, are you? The whole game is to spend as much money as possible. -Come this way. Show us what you've got. We were looking at £80 per item. -We've got an array of things. Very colourful, don't you think? -That caught our eye earlier today. -We got it for £80 for the two. -What did he want originally? This is my first purchase that we made. -Did it belong to Turner? -How much did we pay? -I'm going to enjoy this. Six quid. That's too much. -Did it come with his ear? Seriously, I like what you've bought. I like your offering. This will be an interesting auction. and you've learnt to dance. -What more could you want? -I could do with another hour. Come on, then. We'll give you another hour's lesson. Time to stop dancing around the subject, what did they really think? They had a lot of masculine items, didn't they? -They didn't spend very much, really. That's the way, you can't spend money for the sake of it, can you? -I think the cufflinks will definitely make a profit. They bought the lava ceramics. You're not worried about those at all. What did they pay? £80 at the end of the day? -I am not remotely worried about the lava wares. There's one or two things of ours that I'm worrying about already. -The palette?! What the...? The palette?! -I'm quite happy. We've had a great time. I think we had a fantastic time. It's anyone's to win, this. It's going to be interesting. But we're winning. Well, it won't be long until we find out. heading east to the auction in the Hampshire village of Selborne. But are they still feeling confident about the lots they've bought? Do we have to accept now that our items may not fetch very much money at all? Well, I am fully prepared for that. to see what I would've bought. A Miss Marple cape and a matching bag is where I was looking. -I wish you'd bought that. Today's sale is taking place at Hannam's auctioneers. celebrities and their lots. Finally, here they are. -It is a gorgeous day, isn't it? It is. Look, we've got the sun with us. Fingers crossed. Come on, then. parting with a meagre £109 from their budget. spending £300 on their five auction lots. What does auctioneer Harry Hannam make of it all? The tea and coffee set might be a struggle. the 19th century and really a little unfashionable. My favourite lot are the cufflinks. I think they are very stylish and commercial. it's time to get things under way. It feels like we're just about to go on the dance floor, doesn't it? -It really does. I think we should all hold hands. £35 is bid on commission. 60, your bid and I'm out at £60. £60. On my right, £60. Five, anywhere? Out online. Commissions are out. Fair warning. £60, and selling at 60. -What we paid for it? You didn't lose any money. Not a flying start but better than they might have expected. Concentrate on your own quirky purchases. Zoe and Paul's lightning conductor is up next. -A nice little novelty piece here. £5 is bid. At £25. 30. £30. Your bid. Commission is out. -Selling on the right at £38. -We started well. We started well. Oh, it's such a thrill. -..stuff in our back pocket. Time for Ian and Margie's dress ring. For the dress ring. At £55. 60, five, 70, your bid. It's your bid at £70. -Profit. We haven't had that yet. That's a rather good profit for the ring. Looks like Margie's mastered the high five. Time to see if Zoe's haggling will pay off. It's the gentleman's hair brushes. 20. 25 on the phone. -It's not one of your dealers, is it? -Double your money and some. I'm glad you feel good because that's a very nice return. It could be your biggest profit. It could be. But at least it's a profit. -Did he say, "Are you sure?"? 30 on the net. I'll take two. 35 on the net. Thank you, anyway. £45, net bidder. Well, they got there in the end. A small profit keeps them in the race. I'm not sure if I'm livid, if I'm relieved for him. I'm so confused. I don't know if I can handle this. I'm not even going to wish you good luck, because you don't need it. I've got a bit of interest in these and I have three commissions. -30, 40, £50 is bid. 60 on the net. 65 with me. People are on the net bidding and everything. -It's going to hit a ton. £90 and selling. Fair warning. -You've only made 85 quid. A round of applause. A great find and a stunning profit. I'm not worried. I've always been the bridesmaid, never the bride. Don't give up hope just yet, Ian. are Ian and Margie's next lot. 30 bid for the two lots. Selling. Fair warning at £45. That is a tough one to take. Someone got a real deal for those dishes. -We're the mean girls. We're the mean girls. Can the vintage radio broadcast a victory for Zoe and Paul? Ten, 15, £20 is bid. -Five, I'll take. At £20. Five, anywhere? 35. 38. 40 is your bid. A profit. Not expensive but a profit. gives Ian and Margie a chance for the comeback. That's a disappointing profit for you, isn't it? -Don't rub it in, Margie. Now, Ian secured a great discount but will it be a sign of a profit? We've had interest in these, and 40, 50, 60. One more. 95 is your bid. The hammer comes down at £95. -Hey, that was all right. -Thank you very much. Goodbye. -Quick, let's get out of here. There's one final lot to go and it's Zoe and Paul's lawn bowls. And we have two bids and coming in at 110. Fair warning. Best of two and selling. An incredible profit leaves Zoe jumping for joy. Is there such thing as steward's inquiry? -I would like to have it. I'm the steward round here, Ian. It's time to find out just how it all went. Margie and Ian began the Road Trip with £400. giving them a final total of £358.30. Zoe and Paul also started with £400. giving them a final total of £568.16, making them the winners. Well done. All profits go to Children in Need. Brilliant. Well done. Will I still get a Christmas card? It's been lovely. I've loved it. -It's the end of your antiques experience. I know, but not necessarily the end of your dance experience. -Are you going to drive me home, then? I'm not dancing with you! Time to hotfoot it off into the sunset. But first, a quick phone call home. Wait for it, £168 profit. Am I still allowed to come home for Christmas? I love you, Dad. Bye. -He took it. He took it really well. 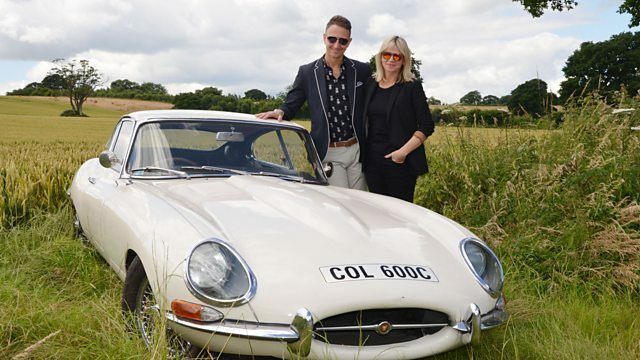 Strictly Come Dancing's Zoe Ball and Ian Waite are quickstepping their way across the south west of England in a bid to turn a profit at auction in Hampshire. Experts Margie Cooper and Paul Laidlaw are on hand to guide them. Paul shares a secret with Zoe about buying antique hair brushes. Ian, though, offers dancing lessons to dealers to secure a discount. Zoe also hears how one village became world-famous for lace production while Ian ends up meeting a giant horse with its own boat.